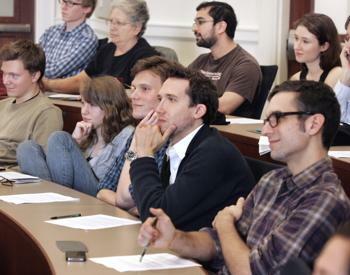 Graduate education at Princeton is distinguished by its residential character, the small size of its formal seminars (usually 5 to 15 students), and the opportunity for a good deal of individual consultation with members of the faculty. The total number of graduate students in Philosophy who are in residence during a given academic year is about 40 to 50, so the ratio of students to faculty members in the department is roughly two to one. Applications are not accepted from students desiring a terminal M.A., but only from those seeking a Ph.D. degree, study for which normally requires four or five years. In the Standard Program, the first four semesters of graduate study are typically devoted to formal course work and independent research; by the end of the fifth semester, the student takes the General Examination; having passed Generals and demonstrated a capacity for doing scholarly work, the student proceeds to write a doctoral dissertation. The requirements for the three Special Programs—the Logic and the Philosophy of Science Track, the Interdepartmental Program in Classical Philosophy, and the Interdepartmental Program in Political Philosophy—are all variations on the requirements for the Standard Program. Although there is no admission with advanced standing, regardless of previous work in Philosophy, students with a strong undergraduate background, or who have done graduate work at other institutions, may be able to satisfy the standard pre-generals requirements more quickly and hence take the General Examination in two years or less. All students are eligible for full financial support, including summer support. The number of graduate students is very strictly limited. In recent years, it has been possible to offer admission to only about one of each dozen applicants. Decisions concerning admission are made on the basis of a careful comparative evaluation of the credentials submitted by the applicants. These credentials must show that the candidate has done superior work in his or her studies and has the capacity to complete successfully a program of graduate work at Princeton. An applicant need not have had a full undergraduate major in philosophy if the quality of previous work gives evidence of strong philosophical promise. For students who wish to enroll in one of the three Special Programs, a major in a relevant field other than philosophy may in fact be an asset. All applicants are required to submit a sample of their written work with their applications. Students pursuing advanced degrees at other institutions occasionally come to Princeton as Visiting Student Research Collaborators. Details of this program can be found here. The department has no program of postdoctoral study and offers financial assistance only to candidates for the Ph.D. degree at Princeton. Click here for Applications and Inquiries.